To begin the next chapter of his life. He has escaped from the shelter in Downey. He has had his vet visit and been declared healthy. He is up on his shots and has his microchip. 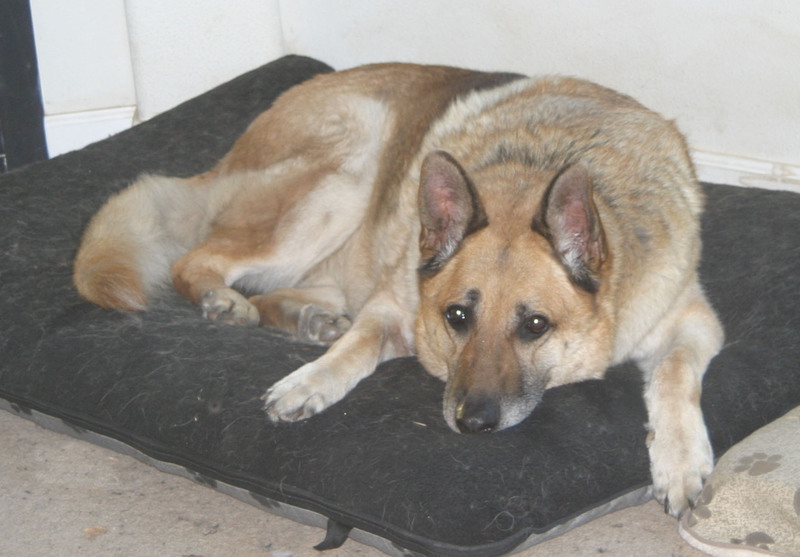 He has passed his ‘manners tests’ both with people and with dogs in his temporary foster home. And his mind is set for a new adventure. He now needs his forever home where he can exercise, slim down, love his people, and meld into his new life. He would love to be an only dog simply because he wants his people all to himself. Because Solo is in the Thulani Program, GSRNC will pay for all of his expenses in his new home–medical, food, pads, etc. All the new home has to provide is safety, comfort, and love. 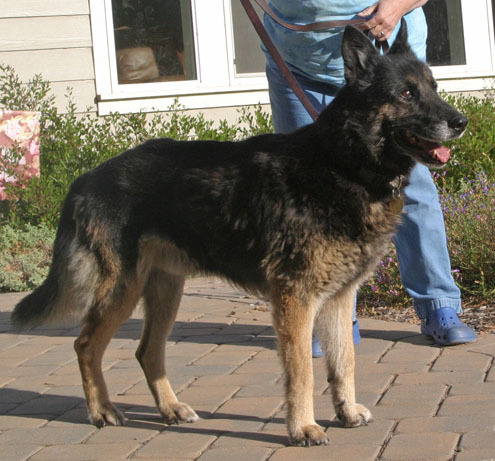 Solo is a bouncy, happy 11 yr old male who has a lot of good life left for him, and we will make sure he enjoys it. He loves people and bonds very quickly and strongly. He is quite comfortable staying home alone during the day without getting anxious, and will relax as long as he gets his walk in the morning and his walk in the evening. He has great manners with other dogs, big and small, and is cat workable (but will need some work and leadership). He loves to go for walks but not long ones (this will probably increase as he loses weight), and rides well in the car, although he will serenade you at times. He knows the basic obedience commands, but only in Spanish. He came to the Thulani Program with a piece of paper clipped to his collar with the Spanish for sit, down, stay, and quiet. 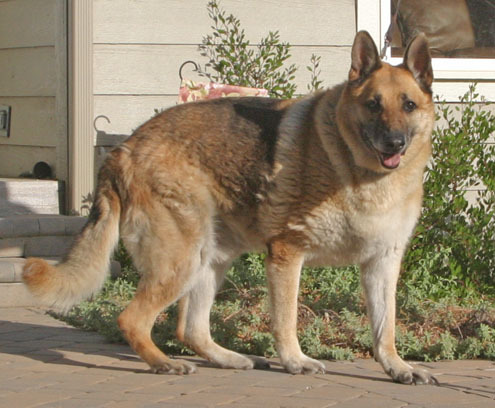 If you would like to consider giving Solo his forever home, please contact Bob at ThulaniDogs@gsrnc.org. Solo is waiting!! He is now among friends in the Thulani Program, having escaped a shelter in the LA basin where he was dumped by his owners with a request to PTS. Sound familiar? It should because we are getting a steady stream of wonderful senior GSDs from the southland, due mostly to the heroic work of Karen Barnes of Westside GSR, operating in her role as the eyes and ears of the Thulani Program in the City and County of LA. 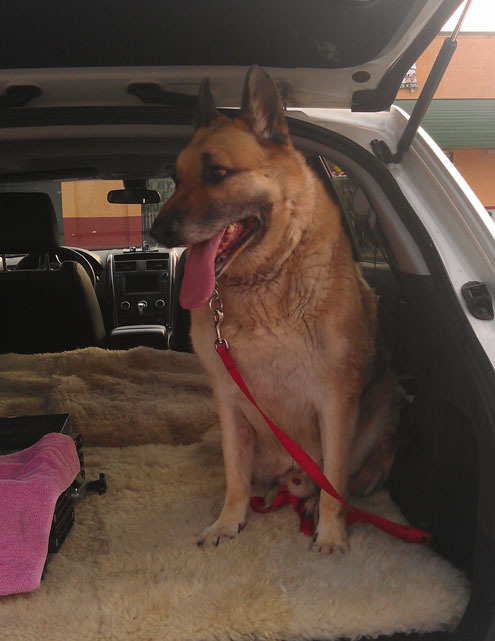 Solo is a bouncy, happy 11 yr old male who has a lot of good life left for him, and we will make sure he enjoys it. He loves people and bonds very quickly and strongly. He has great manners with other dog, big and small, and is cat workable (but will need some work and leadership). He loves to go for walks, and rides well in the car, although he will serenade you at times. He know the basic obedience commands, but only in Spanish. He came to the Thulani Program with a piece of paper clipped to his collar with the Spanish for sit, down, stay, and quiet. Unfortunately for Solo, he is grossly overweight (30-35 lbs), tipping the scales at a hefty 125 lbs. He needs to drop some of that weight before he has a heart attack. Solo is a fine addition to our Thulani Program who is looking for his forever home. His ideal home would be one in which he is put on a diet, gets lots of exercise, and one in which his people are around most of the time. o thanks Solo for coming to the Bay area. We will make it worth your while. We saved Blackie T with very little time to spare, but he is now firmly and safely ensconced in the Thulani Program. And what a spectacular dog he is. He is handsome, smart, and greets you with the most wonderful ‘helicopter’ tail action I have seen in years. He just lights up when people approach, and his doggie manners are superb. He even tolerates cats, but we will let that one go. Blackie, 12 years young, was dumped at the Downey shelter (LA basin) and was scheduled to be PTS last week, but for some reason the shelter had not contacted our Thulni representative about him. 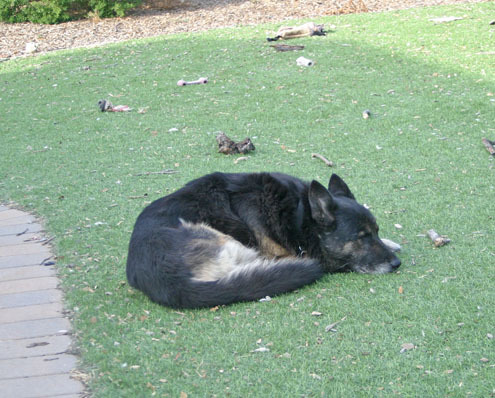 When we learned of him and contacted the shelter, they bruskly informed us that we had less than 24 hours before he would be PTS, and further, would give us almost no information about him other than his picture and his age. We did not even have time to evaluate him properly, but decided to pull him anyway, just hours before he was scheduled. And was that ever the right decision. 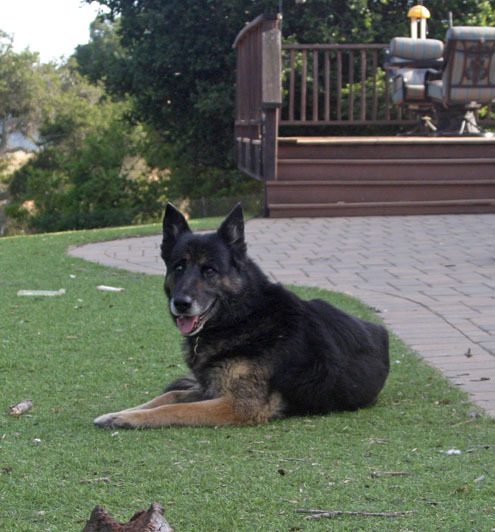 So Blackie is now in the Bay area thanks to the quick work of Karen Barnes in LA, and he is relaxing and enjoying his new-found freedom and peace. He will be heading to his forever home day after tomorrow. Welcome Blackie, you are among friends !! You can relax.